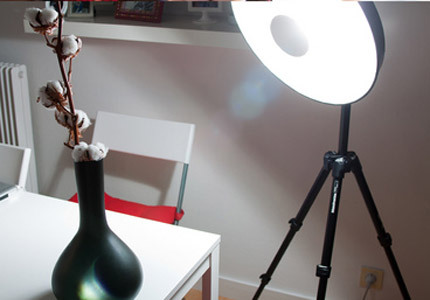 The Easiest Beauty Dish Ever!!! Actually easy isn’t the exact word, cause you can find on the net DIY beauty dishes made of disposable baking dishes but for a durable beauty dish its the best I found, so spare no time and lets dive in!!! 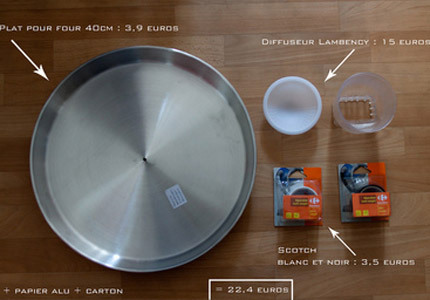 Lambency diffuser – If you don’t have one yet, you can buy one on eBay for about 10$, depending on your main flash model. PLS keep in mind there are some bargains on eBay that sells about 7$, but are universal fit (goes with all flash models). I’d go for a 12$ unit that will exactly fit my flash. Some scotch stripes to proper hold the flash. Black and White masking tapes – for a good looking DIY beauty Dish!!! How to build your great beauty? The tricky part here is to drill and cut the exact hole in the plate! Mark the borders or your Lambency. Drill some holes through the lines you’ve just drown and cut it with metal cutting scissors. White Paint or use white masking tape to get white reflective beauty dish or leave the interior metallic to get a more contrasting lighting. Put on top of your Lambency, a good, thick white board to get all the flash light back to your plate= new beauty dish. Put the Lambency in and off you go. 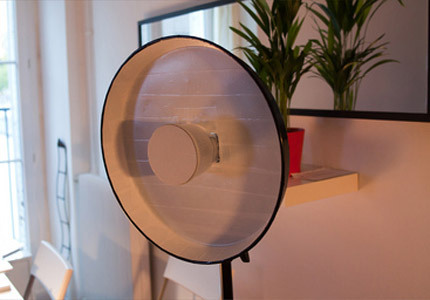 Diy Beauty Dish – In Action!!! You made your own Beauty dish? Liked this tut? SHARE IT! WOW, This one looks amazing! What about the weight the flash leg has to hold in that case? You can see this post as an example (I wouldn’t do that if I were you `-) ). However, I’m doing a cool DIY project that will solve some of those problems, this post will come up soon!!! Funny thing you’ve done, but it will not be efficient …. the surface of the “bowl” should be parabolic. Yours is near flat… meaning that rays of light will go out in every directions when then should be parallel. It is smaller than most but I generally use it in my left hand. If I could have found a smaller plate it would have allowed for less light loss, but the light it creates is quite nice. 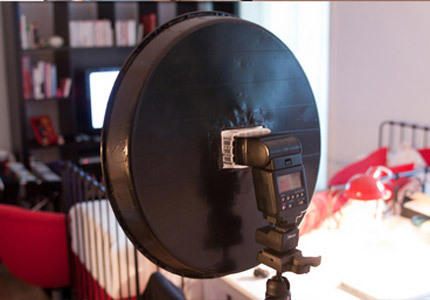 Very nice DIY Beauty Dish. The light pattern looks nice (the inner circle looks good). Why didn’t you try it on a bigger bowl? Does the IR communication still works or its blocked by the dish? I use a Canon ST-E2 transmitter and a Canon 430EX flash. Will I loose my IR communication? Hi Luis, sorry for the late response. I don’t know about the Canon ST-E2, I use the Debao ST-E2 and it works great in house. I tryied the ST-E2 only once and that was a couple of years ago. Indoors with reflections it works .-) Is what you´re saying.